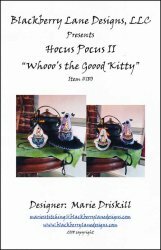 Whooo's The Goood Kitty [K8815] - $13.00 : Yarn Tree, Your wholesale source for cross stitch supplies. A cross stitch pattern by Blackberry Lane Designs. These kitty's are ready for Halloween, dressed up in their orange & black witches hats! Stitch count 45w x 55h.